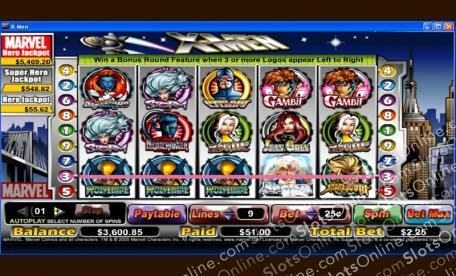 The X-Men have their very own slot and they are paying out at exorbitant rates. Click here to play! Join the X-Men in a quest for justice, adventure, and massive cash jackpots. You will get to play alongside all the greatest characters, as well as their arch nemeses. X-Men is a brilliant 5-reel slot played across nine pay lines, with the more lines activated increasing your payout odds on winning combinations. Join Storm, Cyclops, Jean Grey and Rogue as they attempt to overcome Nightcrawler, Gambit, Mystique, and Sabretooth. Finding three of a kind or more of any character will earn you a payout, but the best odds are reserved for the big guns. Magneto pays out up to 2000:1, while Xavier can earn you up to 7500 times your initial wager, as well as substituting for any other symbol on the reels except Scatters. The X-Men logo is Scattered and triggers the Bonus Round when three or more appear left to right. Team up with the X-Men today and battle your way to winning the Marvel jackpots. The X-Men logo is Scattered and will pay out when two or more appear on the reels. Additionally, if you manage to spin three of them from left to right in one go you will be rewarded with a Bonus Round. Xavier can be substituted for any other symbol on the reels besides Scatters. If you find 5 of him at once he will also pay out 7500:1. The Bonus Round is triggered when three or more Scatters appear from left to right. You must control Xavier and delegate a position to each X-Men before they do battle. Cash will be paid out on X-Men who win their fights.